Duffy Books in Homes presents an entertaining and fun show to inspire children to protect our environment for future generations through reading. It is an unusually hot summer so Duffy grabs some books and heads for the shade of a tree to do some reading. Suddenly storm clouds start to gather and he spots a small, red figure flying through the sky towards him. She crashes into Duffy and introduces herself as Millicent a.k.a. Global Girl! Global Girl has been sent from planet Zyndax to help humans solve the problems caused by climate change. 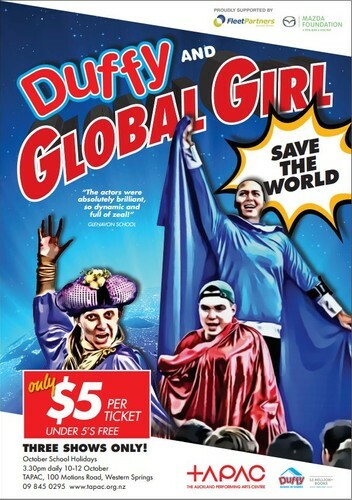 But Global Girl faces some extra challenges in saving the world because she lives with dyslexia. Luckily Duffy knows that some people learn and see things differently and they work together as a team to fight climate change! Suitable for 5-12 year-olds, the show will feature puppetry and exciting science experiments!